Alpine Meadows is one of the premier ski resorts in the county. Alpine Meadows Ski Resort is consistently rated one of the top Western Resorts in the Ski magazine ratings. It is especially noted for excellent spring skiing featuring wide open slopes with perfect corn. The area offers many real estate opportunities. Alpine Meadows real estate includes condominiums, townhomes, single family homes and vacant lots. Alpine meadows real estate features lots of price points to fit your budget. Recreation and entertainment opportunities abound with Tahoe City, Lake Tahoe and the Truckee River all less than 10 minutes away. Whether you are looking for a second home location or a place to call your home, Alpine Meadows real estate offers lots of property options. Alpine Meadows ski resort is located in the North Lake Tahoe area, near Squaw Valley. 11 chairlifts and 2 surface lifts covering 2,400 acres (970 ha) of terrain. A vertical drop of 1,800 ft (550 m) with a top elevation of 8,637 ft (2,633 m). 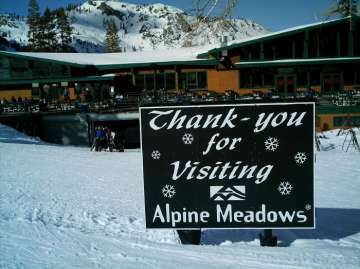 Alpine Meadows and Squaw Valley USA joined forces and combined operations under one ownership on September 27, 2011. The combination of the two resorts has created one of the largest ski areas in the country and allows you to ski both resorts under one pass, the Tahoe Super Pass. You have access to over six thousand acres, 44 chair lifts and over 270 trails to enjoy your mountain lifestyle! Now is the perfect time to explore the Alpine Meadows area for your future home! There are so many activities in the Tahoe-Truckee area that you have at your doorstep, just minutes away from the Alpine Meadows area. Take advantage of the great deals and opportunities that abound in this beautiful and serene area. Whether you have a passion for snow spending time on the ski hill or rafting down the Truckee River in the beautiful Tahoe summers, investing in Alpine Meadows real estate is a choice you should consider! We’ve helped over 2,200 families find their ultimate vacation home or primary residence. Contact us to become another Davis Yoder Group satisfied customer. We have sold a number of properties in Alpine Meadows. It’s a premium club made up of people who have sought out the best and found it.